My 2nd visit to Mainland China (1st visit was last January 2013), my 41st solo backpacking trip, 42 countries visited so far and of course, usual budget do-it-yourself itinerary from arrival to departure. This trip is the 2nd part of the Northeastern Asian winter adventure with Mongolia. China, officially known as the People's Republic of China is a huge country in Eastern Asia (about the same size as the United States of America) with the world's largest population. China had the largest and most complex economy in the world for most of the past two thousand years. Since the introduction of economic reforms in 1978, China has become one of the world's fastest-growing major economies. As of 2013, it is the world's second-largest economy by both nominal total GDP and purchasing power parity (PPP), and is also the world's largest exporter and importer of goods. China is a recognized nuclear weapons state and has the world's largest standing army, with the second-largest defence budget. China is a regional power within Asia and has been characterized as a potential superpower by a number of commentators. 1. China is often considered the longest continuous civilization, with some historians marking 6000 B.C. as the dawn of Chinese civilization. It also has the world’s longest continuously used written language. 2. China is the fourth largest country in the world (after Russia, Canada, and the U.S.). It has an area of 3,719,275 square miles (slightly smaller than the U.S.) and its borders with other countries total more than 117,445 miles. Despite its size, all of China is in one time zone. 3. One in every five people in the world is Chinese. China’s population is estimated to reach a whopping 1,361,512,576 estimated in 2015. China’s population is four times that of the United States. 4. Toilet paper was invented in China in the late 1300s. It was for emperors only. Chinese also invented paper, compass, crossbow, gunpowder, tea, ice cream, stirrups, suspension bridges, waterwheel and printing. 5. Ping-pong is one of the most popular games in China, but it was not invented in China. It originated in Britain, where it is called table tennis. Many historians believe soccer originated in China around 1000 B.C. 6. Twenty million trees are cut every year to meet Chinese demand for chopsticks. China goes through 80 billion pairs of disposable chopsticks a year. 7. 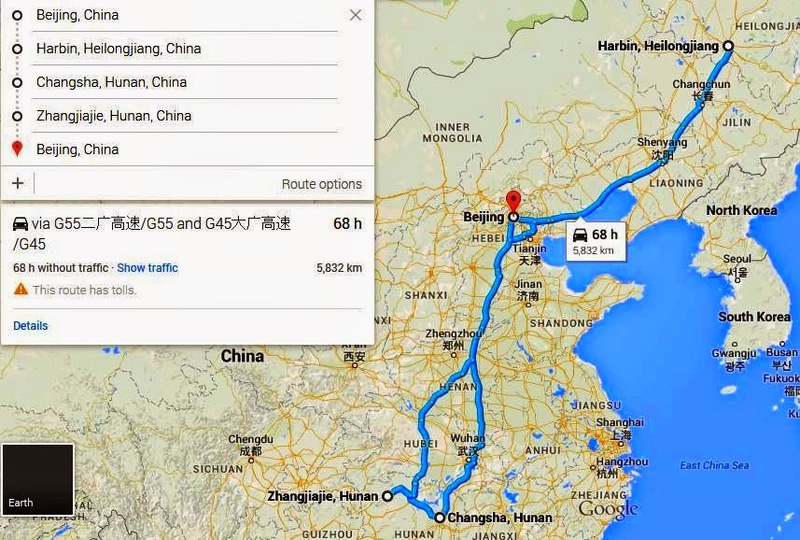 China's railway lines could loop around Earth twice. China's railway length, under operation, totals 93,000 kilometers. The Earth, meanwhile, is 40,075 kilometers in circumference. 8. 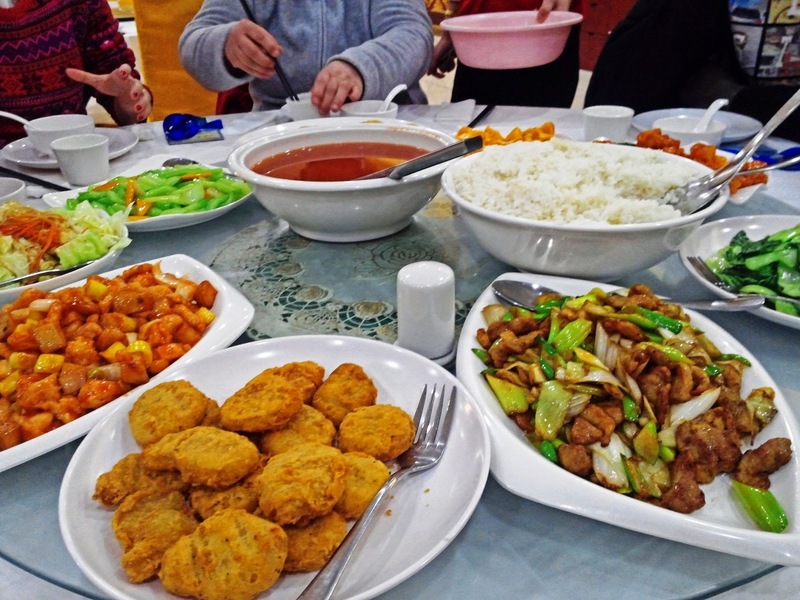 China is the world's largest pork consumer, so it's no surprise that 475 million, or half of the world's pigs reside there. China eats about 5,200 Eiffel towers' worth of pork a year. 9. China has the world’s biggest mall… but it’s been 99% vacant since opening in 2005. It has 7 zones modeled on international regions (Paris, Rome, Amsterdam, Venice, California, Egypt, and the Caribbean). It includes a 25m replica of the Arc de Triomphe, a 2.1km canal with gondolas, and an indoor-outdoor roller coaster. This trip is connected with 4-days Mongolia self-guided journey and supposedly with North Korea also in completion of my Winter Northeast Asian saga. But since the travel agency I booked for DPRK cancelled my 4-days budget tour due to Ebola issues of the government, I decided to spend the schedule of DPRK tour in China where I planned initially as for transit only. My Cebu Pacific flight arrived first in 16th-Feb early morning in Beijing Airport, transit for Mongolia tour then left Ulaanbaatar by train on 19th-Feb.
We left Ulaanbaatar train station exactly on time 0715H via train #24. It passed China border 2030H and performed the Immigration entry process inside train. Roaming Chinese Immigration Officer will check your passport while inside your cabin, then surrender it and wait for around 15 minutes returning your passport for visa confirmation and stamp. This is my first time having experience of Immigration entry via crossborder at night. I made sure I have a photo outside from my camera just in case something went wrong. We left China border around 2100H and arrived Beijing Central Train Station 1200H the next day.